In a new special, we’re taking a look at some of the key sites London landmarks designed by renowned 17th century architect Sir Christopher Wren. 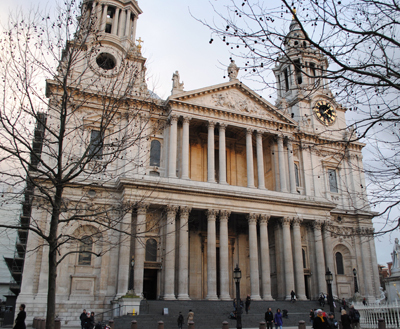 To kick it off, we’re taking a look at the building for which he is most known, St Paul’s Cathedral. Wren’s involvement with the current St Paul’s came after the Great Fire of London in 1666 left the old medieval cathedral in ruins (there is believed to have been four previous cathedrals built on the site with the first dating from around the early 600s). He had already been involved in repairing the old cathedral and had even submitted plans for a new domed cathedral on the site when the Great Fire swept through the city. Wren had already been appointed Surveyor to the King’s Works when, in 1668, he was asked to submit plans for the a new cathedral. After his first few designs were rejected and abandoned, Wren’s plans, albeit substantially altered, were finally approved and the first stone laid in 1677. Building took more than 30 years and it wasn’t until 1710 that the new cathedral was officially declared completed. Interior features include the Whispering Gallery (located 30 metres above the floor below the central dome, it gets its name from the fact that a person whispering into the wall can be heard across the dome by someone who puts their ear to the wall), choir stalls which feature the work of renowned woodcarver Grinling Gibbons, and poet/preacher John Donne’s memorial from 1631, the only pre-Great Fire monument to survive intact. There are spectacular views over London from the Stone Gallery or the highest point of public access, the Golden Gallery. Since its opening, St Paul’s has hosted the burials of numerous of Britain’s luminaries – the tombs of Admiral Horatio Nelson and the Arthur Wellesley, the Duke of Wellington, are both in the crypt as are those of 18th century painter Sir Joshua Reynolds and Sir Alexander Fleming, the man who discovered penicillin along with a host of memorials. Others events hosted at the cathedral include Winston Churchill’s funeral and the wedding of Prince Charles and Lady Diana in 1981.